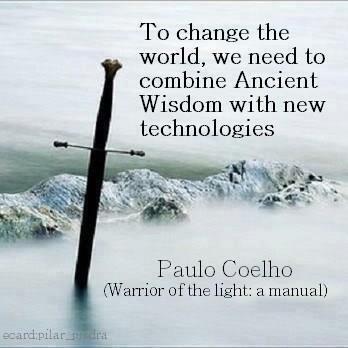 This will revolutionize the world, enriching yourself, your country, and the rest of the world drastically. The following summary will give you some glimpses of the blueprints of USL I have created to help our world vertically and horizontally at the same time for our better, collective future together although not complete by all means. Please try to digest how the vast implications of USL will entail and share about this with people around you as much as possible because I personally am not aware of anything that can be more effective than USL to bring us for our better future in a pragmatic sense. If you happen to have better ideas, please let me know. I am keenly aware of the details of the Occupy Wall Street movement, other Occupy variants, the Zeitgeist movement, Thrive movement, Ron Paul movement, Anonymous movement, Green movements, etc, etc, but in my humble opinion, each one of them is too limited and their solutions overall seem to be too limiting as well although I salute to every single one of these efforts. So I came up with my humble offering solutions using USL, a set of very realistic solutions that can balance us out. Please give some thoughts and if you think this has a good chance, please support us as much as you can. To protect the critical part of the environment as much as possible. Toward the more egalitarian, decentralized, and collaboration-based – not simply competition-based world. and to ameliorate the sufferings of the elderly. If the participating countries don’t adhere to the environmental protections or the provisions to help our world better, then their surplus gains will be compromised and become significantly less. In other words, I use the greed of the rich to recycle their luckily gained wealth using USL to help the severely underpriveleged populations in a geedy speed. This is possible because the economic value behind USL is astronomical. The equations behind the idea dictate all. My main idea is the values of the human capital. Although I had established various estimations as to how USL would transform human capital – in economic sense – in a totally unprecedently massive scale, past 5 days I discovered that there have been numerous studies from the established academia that showed the strong correlations between the education, especially math and science, and the strength of the national economy. This article is to utilize the established results to push USL agendas to transform the world in a way that USL mantra repeats: the fastest, easiest, and cheapeast way to make the world much better while average persons learn STEM subjects faster than the most brilliant prodigies in the world. If this is your first visit here, please check out the USL mission statements first please. The numerous studies that showed the strong correlations between the education – especially math and science at the upper elementary school, middle school, ( or high school levels) – seem to conclude that roughly advancing math education by about 1 year ahead of the normal ones – in the USA for instance – will contribute about 7-9% of the USA GDP, which seems to be about 0.5 standard deviation differences for various studies, which is correlated to about the surplus 1 Trillions of USD annually. advancing 1 year of math makes roughly the difference between Canada/Germany (as they are about 1 year ahead the USA) vs. USA or .. So if the USA catches up with these countries, the USA’s annual GDP may increase almost $1 Trillion annually from the point of achievement on. USA vs. Turkey/Israel (as they are roughly about 1 year behind the USA) in average. Or countries like South Korea/Singapore are about 1.5 years ahead of the USA for math overall. So if the USA catches up with these countries, the USA’s annual GDP may increase about $1.5 Trillions annually from the point of achievement on. I have found out about the research papers by economists, relevant for the above over the past several days. Now, an exciting part is that for USL, advancing just 1-1.5 year out of 12 years of the regular math – which is like 7-11% learning speed gain – is a piece of cake as the main focus of USL is to make average students learn 1,000-2,000% faster. At this point, if you want some substantiations of my claims, check the USL pilot study results here and browse through the website. Can you unfathom what this really means? If you directly apply this to the economy of most of the developed countries or almost developed countries, this means that the economic potential of USL is mightier than anything you can possibly think about. As you read on, things will get clearer. And this is the part that USL will completely rewrite the global history massively if people in high positions start noticing what I have been doing. So far, my focus has been to gain supports from various activist groups over the past a few weeks, but the supports haven’t been what I have been expecting yet. So I changed my strategy and decided to provoke the public with what they respond the fastest, the human greed and lust for money. Do you know what does it mean to get the GDP 7-13% extra boost and continue on? For the USA, for example, that is about 1.5 Trillions of the surplus USD for free more or less, which means that you may get about $6,000-7,000 extra cash in your bank account for free while you have done nothing new if you are an American. The funny part is that achieving this, using USL, is too easy for USL. Since I started this to run USL as a SI (Social Innovation) and SE (Social Enterprise), I will help the governments that need my help, boosting their economy. I will help them, however, under some strict conditions. I didn’t create this to feed the greed after greed, to help the rich get richer and the poor get poorer. One of my main goals is to end the extreme poverty of our world, which has too many negative and destructive repercussions. Another issue is the employment issue. Each time I mention the speed and effectiveness of USL, the first things I see from the eyes of math and science teachers is the fear. The brewing fears and angers. After seen enough of the agressions from their eyes, I decided to minimize the unnecessary troubles as I am not here to destroy the job market of the math and science teachers. Absolutely not. In fact, the job perspectives will have different approaches later on as I intend to shake up the global established education in significant degrees as the current ones are simply not working well at all in my opinion. Now, let’s go back to the economy. At the moment, I am thinking of boosting GDP by about 10-20% for the USL-supporting nations initially. If other countries start collaborating with me first, that is fine. The earlier, the better. The more, the better. I am not in favor of the US at all as a matter of fact. For me, everyone and every country is equal. Regardless, for the simplicity, let’s focus on the USA as an example. For the USA, they can catch up with the South Korea, Singapore, or Finland, the frontline of edcuation and beyond if they comply with my demands. To my best knowledge, the USA education reform is not persuasive at all. They keep on pumping up the a lot of money for the education reforms, but I am highly skeptical that they are going to get much boost at all. Every participating country, however, must follow my protocols as these are designed to equalize the global wealth distribution. The more each country deviate from the protocols, the lesser the country will gain benefit from USL, which is against their interest eventually. Americans, if they embrace USL, will make $2-3 Trillions of extra dollars annually, but they have to redistribute at least about 20% of those extra boost money, meaning about $400-600 Billions. (For this, let’s say $300-600 Billions from $3 Trillions of GDP increase. Note here that this $3 Trillions is almost 3/4 of the total federal budget of the USA annually). While I will push to resolve the currently dire global student loan debt crises – as I published in the last post here – I will raise some new strategies here today. My suggestion will be roughly outlined as follows: (this part will be subject to change a lot as there are too many variables here.) Although I used the USA here as an example, but basically the same will apply to every participating country in proportion. 10% of this (about $300 Billions ) goes to the poorest 50 countries to build their educational infrastructure and end their extreme poverty immediately, hopefully within a year time frame. About 10% goes the second poorest 40 countries and help them build their infrastructure for their education. Another 20% will be used for the global scientific projects exclusively for the sustainability-based science and technology. Another 10% goes to the elderly suffering in the USA. Another 10% will go to the global environmental protection activities, not confined by a country border. Another 20% goes to various poverty reliefs in the USA, especially children. If Americans get the extra free ride of $3 Trillions, giving up 20% of it (which is about $600 Billions) won’t be such a big of a deal as the USA will still have the extra $ 2.4 Trillions of the surplus. I have reasons to give this initially push just a bit. Any country that is participating in USL operations should comply strictly. If they violate the rules or protocols, USL – for this matter whatever the participating countries may be – will cut them off completely or significantly more proportions of their surplus will be reduced to be used for the development for the other poorer nations. (This parts will require a lot of work for sure.) Of course, this will be against the interest of each participating country. This part is extremely critical because I am trying to bring the equalization of the world economically, socially, and politically as soon as possible. My hope is to achieve the initial goal within the first 3 years. By then, the extreme poverty in the world is completely eliminated or at least over 90% eliminated. For the second stage, I will try to get rid of the secondary issues… within 3-4 extra years. During this time, we will see the significantly narrowing gaps between the developed world and developing world as the under-developed world will be almost non-existent and the gaps between genders will be much less as well. For the third stage, another 3-4 years will see the reasonably good equal societies throughout. USL will make sure that the rich countries pull the poorest brothers and sisters of the world out of the troubles within a few years. In the subsequent years, I will release the incrementally faster versions of USL. Each participating country will go significantly ahead of their competitors – by collaborating with USL – and at the same time, all the miserably suffering people from the poorest countries will overcome their worst nightmares in short time frames. Since UN and its umbrellas, such as UNICEF or UNESCO, are doing painfully sluggish jobs, and the multi-billionaires in the world are barely doing anything except some show-offs and convenient gestures, I decided to take the entire matter personally and push in the directions that I am summarizing here. My original plan was to make over a billion USD per year (as a Social Enterprise) and then spend over 90% of them to build the infrastructures of education in the poorest countries, etc, but I can’t do too much with a few billions of USD all for myself. 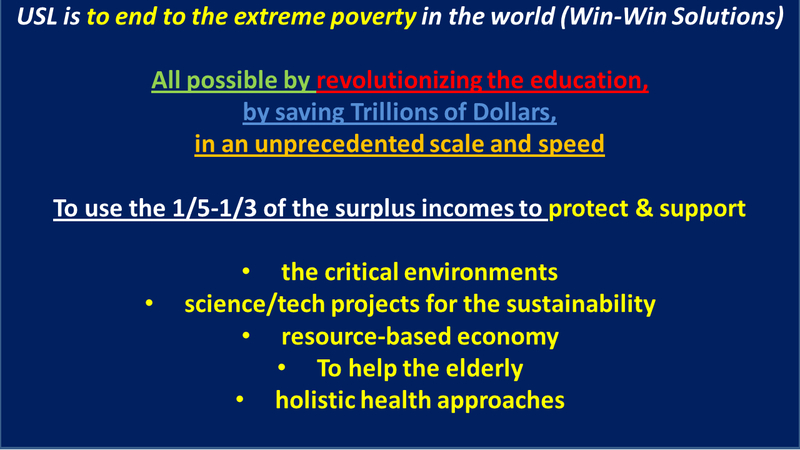 So, the more efficient and natural choice for me is to collaborate with the global network of governments and incrementally raise the education levels till the global communities reach certain wholesome equilibrium in 5-10 years from now, depending on who the global communities respond to USL. With my new strategies, however, if the G20-30 countries start participating the USL initiatives, then they progress well while the poorest brothers and sisters will catch up soon. NOTE, however, that the GDP increases and all the obsessive competitions are unsound, and the modern, western obsession about the infinite growth of economy should be overcome. Realistically, however, I have to acknowledge the need for the economic growth from each country as I can’t simply ignore the collective reality. So I decided to feed the collective greeds of the developed world and make them grow more while I try to pull the under-developed world out of their dust as they need to rise up. In the meanwhile, however, the growth will eventually will stop even with the USL down the road in about a decade or so. I hope to achieve by then that post- western economics people realize that the current model of economics needs to be overcome. The competition and greed eventually will need to be replaced by compassion and collaboration driven not by the endless growth, but by the sustainable growth and healthy growth only. I hope to equalize our world within next 10 years more or less, if not 10 years although everything will depend on what kind of supports I will get. and help the poor comunities of each participating country as well? The mathematics and economics of the balance equations I am proposing is very clear. For more details, I am thinking of publishing in a book format as they may be over-detailed for the average readers. As I repeat again and again, USL is the fastest, easiest, and cheapest way to totally revolutnize our world for the much better peacefully and the most efficiently. So, please stop being passive observers and support USL from today on if you really care about our world that is on the rollercoasting rides toward the point of no return for our annihilations unless we stop them collectively. Please like it, comment on it, share it, and subscribe for the future updates and announcements.